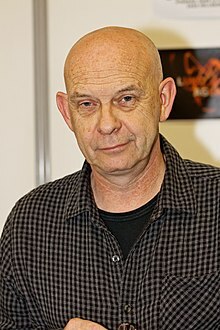 Douglas William Bradley (born 7 September 1954) is an English actor, best known for his role as the lead Cenobite "Pinhead" in the Hellraiser film series. Bradley was born in Liverpool and attended Quarry Bank High School. Bradley is best known for playing the role of Pinhead, the lead Cenobite in the first eight Hellraiser films, as well as Captain Elliot Spencer in two of the films, Hellbound: Hellraiser II (1988) and Hellraiser III: Hell on Earth (1992). He is one of only six actors to play the same horror character at least six consecutive times, the others being Christopher Lee (who portrayed Count Dracula), Robert Englund (who portrayed Freddy Krueger), Warwick Davis (who portrayed the Leprechaun), Brad Dourif (who portrayed Chucky) and Tobin Bell (who portrayed Jigsaw). Due to his eventual skill at application and removal of the Pinhead appliances and costume, he has been credited in some of the Hellraiser films as an assistant make-up artist named Bill Bradley, using his middle name. Bradley appeared as a gym teacher in an advertisement for Direct Line insurance in the UK. He has performed narrations on several songs by Cradle of Filth, an English extreme metal band. The first was 2000's "Her Ghost in the Fog", as well as "Death Magick For Adepts" and "Tortured Soul Asylum". However, he could not appear in the music video and was replaced by actor David McEwen. Bradley also appeared on "Swansong for a Raven" and "Satyriasis". In 2006, he lent his narrations to "Rise of the Pentagram" and "Tonight in Flames". Continuing in this vein, Bradley has contributed guest vocals to Cradle of Filth's 2008 album Godspeed on the Devil's Thunder, on all songs except "Tragic Kingdom". Bradley has appeared in many short horror films, such as Red Lines and On Edge. He is a member of the UK animation company Renga Media, makers of the independent Dominator films and shorts, dividing job roles between producer and voice actor. He voiced the Loc-Nar in the short animated crossover Heavy Metal vs. Dominator, in which characters from the Dominator universe meet and fight with characters from the film Heavy Metal 2000. After his roles in the Hellraiser films and the 1990 horror film Nightbreed, 2006 saw Bradley star in Pumpkinhead: Ashes to Ashes and 2008 saw Bradley once again returning to Clive Barker's cinematic universe by way of a featured appearance in Book of Blood. He had a small guest star appearance in the 2008 black comic horror The Cottage. In 2010, he starred in the Anglo-Spanish horror film Exorcismus, and he joined the Nazi zombie horror The 4th Reich in March 2010. In 2011, he played a man called the Doctor in the British film noir Jack Falls. In June 2011, it was announced that Bradley would be providing a voice-over for an independent film called Lucifer's Unholy Desire, as well as performing in the film The Reverend. In 2012, he played "Maynard" in the fifth film of the Wrong Turn series, Wrong Turn 5: Bloodlines. In 2013, he performed in the indie film Scream Park. Bradley voiced the Sith Emperor for the massively multiplayer online role-playing game Star Wars: The Old Republic, based in the Star Wars universe. In 2018, Bradley joined Blackcraft Wrestling as “The Preacher”, a cult leader who acts as a General Manager type figure to the promotion. Bradley is the author of Sacred Monsters: Behind the Mask of the Horror Actor, which explores the history of masks in society and their applications in horror films. He is a longtime close friend of novelist Clive Barker, the two having met when they attended secondary school, and has worked with Barker in various projects since the early 1970s. ^ a b "Doug Bradley - Behind The Voice Actors". Retrieved 11 September 2017. ^ "Doug Bradly". Hollywood.com. Retrieved 27 May 2016. ^ "Interview: 'Hellraiser' star Doug Bradley - Your Move Magazine". 28 October 2016. Retrieved 12 September 2017. ^ "Abertoir - Talk by Doug Bradley". Archived from the original on 24 March 2012. ^ "Experience Hell on Earth with Doug Bradley in Vegas". 26 June 2012. Retrieved 15 January 2018. ^ "Doug Bradley and William Powell discuss bringing Horror Las Vegas". 28 June 2012. Retrieved 15 January 2018. ^ Doug Bradley, RengaMedia.com; accessed 15 January 2018. ^ "Exorcismus Expands Cast and Updates Storyline". 24 May 2012. ^ "Doug Bradley Joins The 4th Reich". 8 August 2012. ^ "UPDATED: 'Hellraiser' Actor in Town for Local Movie Role". 14 June 2011. ^ Owen Williams (27 April 2012). Bradley Takes a Wrong Turn. Empire online. ^ Power, Ty. "Behind the Mask of the Horror Actor - Book Review", sci-fi-online.com; retrieved 25 October 2013. ^ "Doug Bradley & Nicholas Vince join 'The Hairy Hands". Retrieved 12 September 2017.